The clubs agreed to reverse fixtures due to the beating Dalry’s pitch has taken from recent weather. 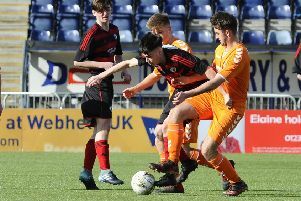 And it proved a shrewd move for Gordon Moffat’s side who bounced back from defeats in their previous two games - although it until the second half for Vale to get properly into the game and back to playing the football they are recognised for. Vale did have the best of the chances in a closely fought first half. 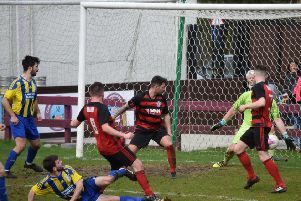 As early as the second minute Liam McGonigle headed over after a good build-up between Kirk Forbes and Chris Duff, and then on-loan Hurlford player Chris McKenzie chipped the keeper with the outside of his foot only to see his effort sneak over the bar. Two minutes later Duff played a lovely ball through the middle to Johnstone who returned a perfect cross to Duff but his final effort was cleared for a corner. Dalry had a brief spell when Browning fired over an excellent cross which was taken first time by Stuart whose shot crashed off the bar. Just before the break McGonigle played a nice one-two with McKenzie, but his shot was just too high and the score remained goalless at the break. But Rossvale went straight into attack at the start of the second half and won a corner from which McGonigle’s delivery was nodded back across by Gary McGrath for Matt Niven to ’score with a fine header. Another Niven header and a McGonigle 20-yarder brought out good saves from the Dalry keeper and it seemed only matter of time before Vale would add to their score, particularly after Stuart was red-carded for a two-footed tackle on Forbes. Thistle were now being stretched all over the park and the second goal finally came in the 72nd minute when Johnstone cut in and found Duff who beat the advancing keeper with the neatest of touches. Rossvale were denied when McKenzie beat the keeper with a header only for play to be called back and a penalty awarded which McKenzie took himself but was denied by a very good save from the Dalry keeper. But the home side did get a third 10 minutes from time when Duff looked up and chipped the keeper from 25 yards. Next week Rossvale are back at Huntershill with another tough game against Craigmark Burntonians.